Almost Christmas will resonate with most families and while it is a heartwarming and sometimes sad movie, it is enjoyable nonetheless. We can't choose our family and many times we don't get along with them. We try to avoid getting together whenever possible but during the holidays, we often head home for a few days and suffer through the family drama. Of course, Hollywood likes to play on that drama and there is always a movie coming out dealing with family. The latest, being released this week on Blu-ray, DVD and Digital HD is Almost Christmas. The Meyers' family have a traditional Christmas gathering, including the famous sweet potato pie but now that the four children have grown, and have families of their own, it's harder to get them to all come home. However, when the family matriarch passes away, the children decide to spend this Christmas with dad at the family home. Of course, the rivalry and bickering ensue with some love and laughter are thrown into the mix. Cheryl (Kimberly Elise; Dope) is the doctor in the family who is married to a washed up former international basketball player with a wandering eye. Christian (Romany Malco; Weeds) is the successful older son who is running for Congress. Rachel (Gabrielle Union; Bring It On) is the younger of the two girls who is divorced, broke and trying to become a lawyer and Evan (Jessie T. Usher; Independence Day) is the later in life baby who is a collegiate football star hoping to be drafted but happens to have a pain pill problem. Rounding out this family is the Patriarch, Walter (Danny Glover; Lethal Weapon), who just wants his kids together and getting along. Oh, and we can't forget Aunt May (Mo'Nique; Precious). As you can tell, there isn't anything unique about this story. There is also the overachiever with the perfect family, the one who can't get her love life together. However, when she comes home, her high school flame is there, and single, and while she resists him, he does his best to win her over and eventually succeeds. And, let's not forget the one who judges everyone else but doesn't seem to have her life particularly together either. All the main characters are there and Aunt May just adds a sprinkle of tough love into the mix. The real prize of Almost Christmas is the cast. Academy Award winner Mo'Nique shines and Danny Glover is just superb. One can watch that man for hours and be mesmerized by his talent. The younger cast has great "family" chemistry and blend nicely with these giants in the industry. Union once again shows us why she is a continually working actress and she and Elise play off each other well. Usher and Malco round out the siblings nicely and Omar Epps (House) as the high school flame to Union's Rachel is an added bonus. The Blu-ray video quality is solid with a 1080 high definition picture quality and a 2.39:1 aspect ratio. The Christmas lights shine beautifully and the outdoor scenes are sharp with details. The DTS-HD Master 5.1 audio is clear and well mixed and shows off the film's eclectic soundtrack. Unlike some other Blu-ray releases, this one comes with a variety of extras and they are interesting and enjoyable for the most part. While there are some bloopers at the end credits, the disc also has even more gags and some of them are funny. There is homage to the beauty that is Mo'Nique, called Aunt May Unplugged, and watching her work is a joy. The disc also includes Audio Commentary, The Director's Diary, Walter's sweet potato pie, My favorite scene (spoiler: they all choose the dinner table scene), and Home for the Holidays, which is broken into sections and discusses the music, the casting, the location shoot (Georgia) and more. 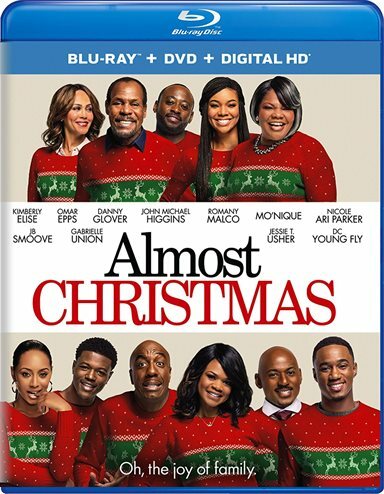 Download Almost Christmas from the iTunes Store in Digial HD. For more information about Almost Christmas visit the FlickDirect Movie Database.